Avant Garde Dance is a London-based company pushing the boundaries of hip-hop and contemporary dance. The dynamic performances have musicality at their core, and explore a myriad of styles, themes and media. Its mantra, "innovate never replicate", is evident throughout its portfolio of work. Led by Artistic Director Tony Adigun, the company is committed to producing artistic work that is entertaining and challenging. The company was formed by Tony in 2001 as a creative release from the world of commercial dance that he was working in. The Company are intrigued by a sense of difference and rebellion, and celebrate individuality and uniqueness. Their creative ambition is boundless, they are enterprising in their approach and imaginative in their ideas. Avant Garde Dance pioneered the confluence of contemporary and hip-hop dance and have created a new style, and unique movement vocabularly. As a result of bringing the commercial industry and artistic world together they are now highly respected in both hip-hop and contemporary dance circles. They have performed and produced work both in the UK and internationally including at The Place, Breakin’ Convention, Sadlers Wells, Pavilion Dance, SouthBank Centre, Barbican, DanceXchange, Greenwich Dance, Latitude Festival, British Dance Edition 2012/2014, Greenwich & Docklands International Festival, Brighton Dome, East London Dance at Stratford Circus, Barcelona Festival and Madison Square Gardens New York. Avant Garde Dance are an East London Dance Associate Company and Tony Adigun is a Work Place Artist at The Place. The company was formed by Tony in 2001 as a creative release from the world of commercial dance that he was working in. The company is intrigued by a sense of difference and rebellion, and celebrates individuality and uniqueness. Its creative ambition is boundless; it is enterprising in its approach and imaginative in Its ideas. Avant Garde Dance pioneered the confluence of contemporary and hip-hop dance, and has created a new style and unique movement vocabulary. As a result of bringing the commercial industry and artistic world together, the company is now highly respected in both hip-hop and contemporary dance circles. It has performed and produced work both in the UK and internationally, including at The Place, Breakin’ Convention, Sadlers Wells, Pavilion Dance, SouthBank Centre, Barbican, DanceXchange, Greenwich Dance, Latitude Festival, British Dance Edition 2012/2014, Greenwich & Docklands International Festival, Brighton Dome, East London Dance at Stratford Circus, Barcelona Festival and Madison Square Gardens New York. Avant Garde Dance is an East London Dance Associate Company and Tony Adigun is a Work Place Artist at The Place. Open up the sleeve of The Black Album to find a line-up of effortlessly stylish dance. The Black Album is a triple-bill in which three distinctly different hip-hop choreographies are woven together like a concept album, taking you on a soulful journey. Using innovative cutting-edge contemporary dance, you will experience a new way to listen to dance and a new way to watch music. In Omega, five dancers and five columns of light improvise and respond to experimental DJs Jazzanova. A Classical Break presents a humorous and cheeky partnership between break dance and the music of Beethoven, Mozart and Mendelssohn. The language of breaking and the detailed choreography accentuate the orchestral score resulting in a number of magical musical moments. Freight details: 1 London taxi or a similar vehicle can be sourced locally. Combining traditional street theatre with high-impact, high-energy street dance, Taxi! takes the audience on a comic journey through London’s urban hurly-burly, seen through the eyes of a cabbie and his motley collection of passengers. Set in, around and on top of an iconic London taxi, this street theatre fuses elements of parkour, contemporary and hip-hop dance. The performers switch personalities and costumes, and present broad, comical characters delivering unfalteringly dynamic choreography. Omi explores the complexity of water: a natural and fundamental element that is essential for life but which also has the power to take it away. This performance by five international male dancers is about the sensuality of water, and its potential for beauty as well as darkness. The relationship between man and this life-giving force is demonstrated through physicality and symbolism. Avant Garde Dance can offer an extensive dance education programme as part of any touring work. This includes: one-off workshops, masterclasses, week-long residencies, curtain raisers and professional classes as well as post show discussions. The workshops are led by the Tony Adigun and the artistic team or company members, and can be adapted for all ages/levels. "Bold inventive dance, an adventure in hip-hop." "Superbly timed and musically exhilarating." "Avant Garde Dance takes risks, and it pays off." 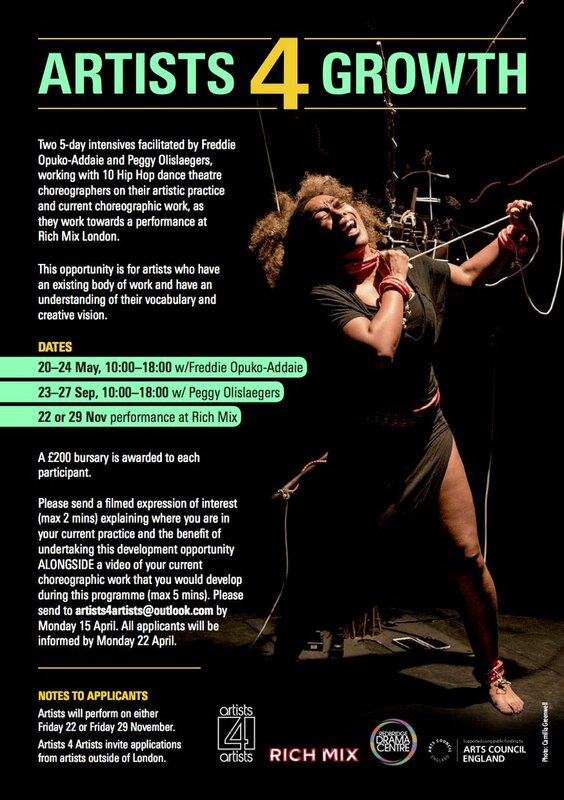 @AvantGardeDance RT @Artists_4A: Our last artist development opportunity for the year is here!!! DEADLINE Monday 15 April.